The stresses of pregnancy and the daily exhaustion that can occur while raising children can sometimes cause signs of premature aging to appear in the face. Wrinkles, fine lines, and loss of volume in facial features are not uncommon in new moms; however, they can be effectively improved with a number of non-surgical cosmetic enhancement options. Treatments like BOTOX® Cosmetic, injectable dermal fillers, and IPL (Intense Pulse Light) therapy can be part of your total mommy makeover from Dr. Tom Lintner. With these facial enhancement options, you can rejuvenate your appearance and look more youthful and refreshed. BOTOX® Cosmetic is the most popular non-surgical cosmetic enhancement procedure available. Wrinkles and fine lines along the face are typically caused by muscle contraction in the affected areas. BOTOX® injections are designed to temporarily prevent those muscles from contracting, resulting in a smoother appearance to the skin. Results from BOTOX® Cosmetic often last up to four months, and can be maintained with follow-up treatments. Although many people confuse injectable dermal fillers with BOTOX® Cosmetic, they are actually very different types of treatments. Injectable dermal fillers can not only fill in lines and wrinkles along the face, they can also add volume to facial features such as the lips and cheeks. These treatments can give the lips a more youthful and contoured appearance, improve the loss of facial fat in the cheeks, smooth out deep wrinkles and nasolabial folds (lines between the nose and mouth), and more. Here at Advanced Aesthetic Surgery, we use some of the most popular dermal fillers, such as Restylane® and Juvederm® to provide our patients with effective, long-lasting results. 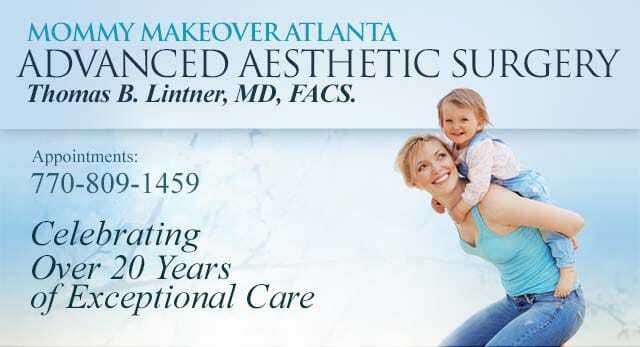 To arrange your private consultation with Dr. Lintner to talk more about incorporating fine lines and wrinkle reducing treatments into a comprehensive mommy makeover procedure, please contact our practice.